I have a confession. I made this months ago. It was delicious, and when I posted about it on Instagram, a few people asked me about the recipe. I sent the instructions to those who had asked, but then was dealing with terrible nausea from pregnancy and couldn't even look at these photos without wanting to barf (These and almost every other food photo on the web/social media. I ended up unfollowing a bunch of food instagrammers during that period because I could hardly look at their photos... It was a serious problem). Anyway, so months later, here is the recipe, now that I can look at these photos and think they look delicious once more. It really was a terrific stir fry! And super easy. You can bet this will be on our table soon, because I am all about the easy dinner prep these days! If you aren't the vegetarian type, feel free to add chicken (probably the tastiest option), steak or pork to this dish. In a medium pot, heat water to a boil. While it is boiling, prepare the sauce by combing ingredients in a jar and shaking until combined. Add your noodles to your water and stir once or twice to keep them from sticking to the pot, and cook according to the package directions. Next, pour oil into a large skillet and heat . Add the onion and carrots, and cook over medium heat for 5-8 minutes until soft. Add the bell pepper and cook for another 1-2 minutes. 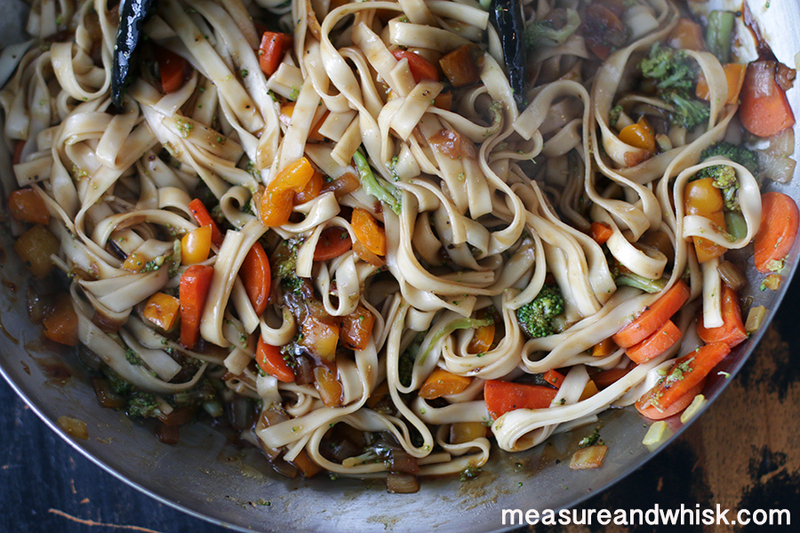 Add the broccoli and briefly cook (another 1-2 minutes), then turn down the heat to low until the noodles are done. 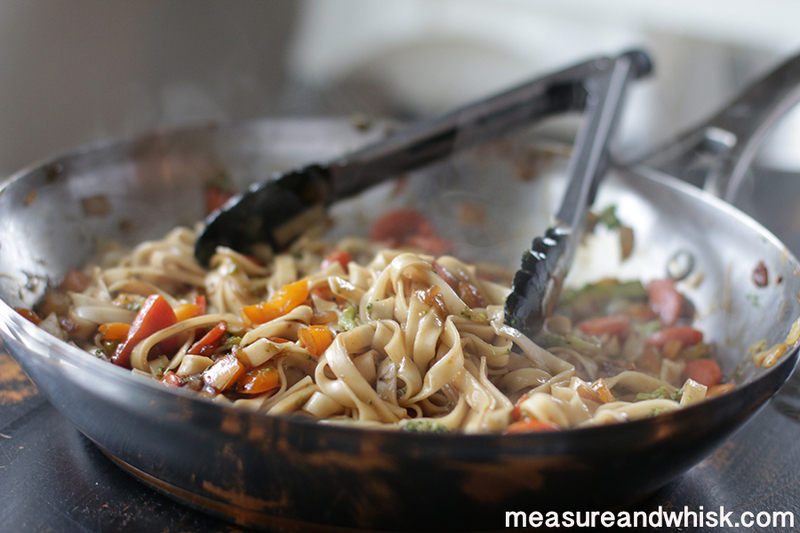 Then drain the noodles, toss them into the large skillet, and add the sauce. 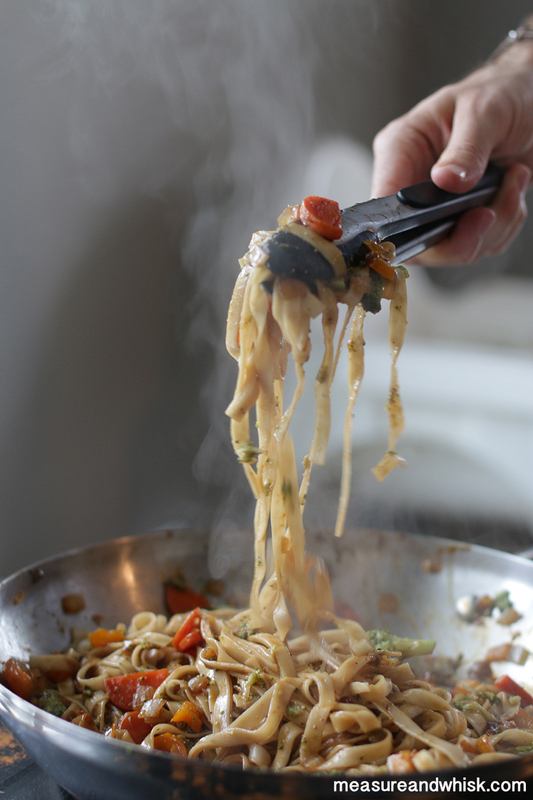 Stir all together until sauce is coating every single noodle, and serve immediately. Enjoy!